typical reactive acid stains. There are no acids or harmful chemicals integrated in its design. ARTesian Stain may be applied over smooth troweled or textured concrete, cement-based overlayments, vertical or horizontal concrete and masonry surfaces, artificial rock displays, water features and themed finishes. 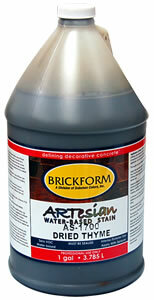 ARTesian Stain is a water-based formulation. ARTesian Stain contains no hydrochloric acid, making it more environmentally friendly. ARTesian Stain is available in 18 standard colors. Refer to the ARTesian Stain Color Chart for colors available. Special colors and effects can be produced by using one or more applications, or by blending two or more colors.